Well everyone knows ancient nails were square shaped and not round! 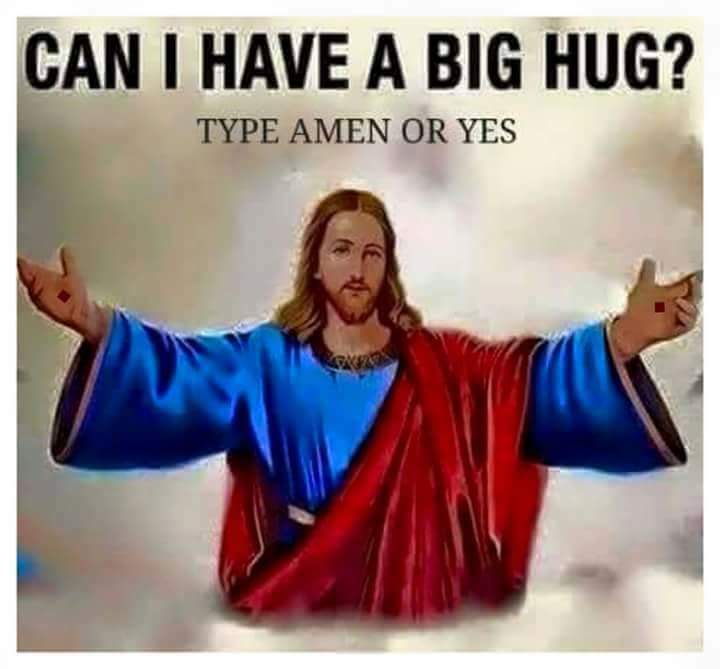 I heard of a catholic image of 5he transfiguration where he has nail holes because the composer saw it as reflecting his glorified state with the Passion. What does the phrase in the first one say? The saints of... I can't read the rest. The colorful one had me think "Catholic". That's the St. Francis of Assisi icon, right? 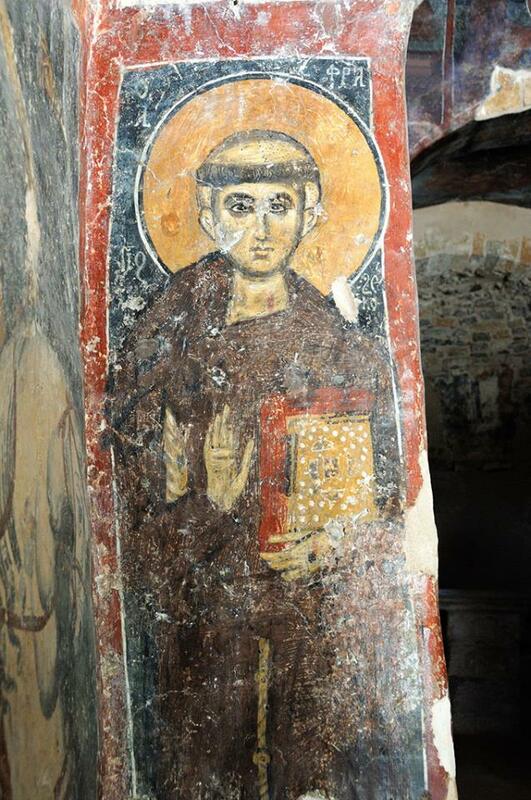 "The portrait of St. Francis of Assisi indicates that the theological disagreements between the Patriarch of Constantinople and the Pope did not necessarily prevent a peaceful coexistence of Orthodox and Catholic communities at a local level..."
Thanks for living on the edge, as all else takes up to much room! Since I can't see facebook where I am, would you mind telling where/ when this fresco was painted? Thanks. The church was built in the XIIIth century and in the following century it was decorated at the expense of a local wealthy man. Its three altars are dedicated to the Dormition of the Virgin Mary (central), St. Anne (left) and St. Anthony the Great (right). The donor was portrayed with his wife and their daughter on the wall near a side entrance; they wear their best clothes. The donor was probably an elder of the village whom the Venetians integrated into their aristocratic government system. Interesting. Some further digging using the text you provided tells me the church is in Crete. I wonder how common it was at the time for Orthodox churches to have more than one altar. The donor was portrayed with his wife and their daughter on the wall near a side entrance; they wear their best clothes. I'm not sure what relevance that has to my comment (which you likely misunderstood), but a) that's not my jurisdiction and b) I've been making fun of that stuff for years. All I'm saying is that commending laypeople in the sanctuary for their service is not something restricted to the Greeks. 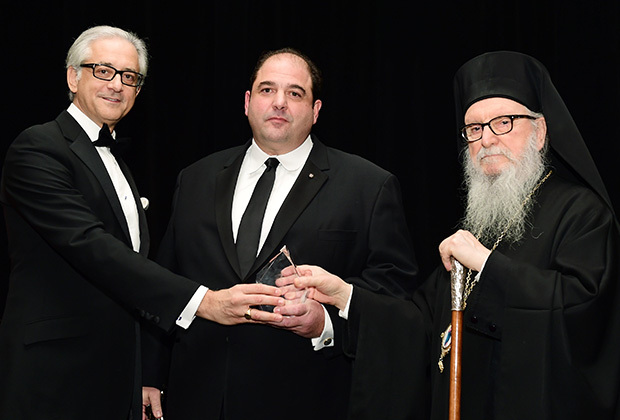 ...it was an inside joke between Antonis and me, not an invitation to begin another social justice crusade. I don't fault you for not knowing that, but try not to let things get to you so easily. No one relevant to this thread. I wasn't trying to start one. I just think your "I'm such a detached cynic" snark posts are a bit hypocritical at times and I felt like saying so. I just think your "I'm such a detached cynic" snark posts are a bit hypocritical at times and I felt like saying so. 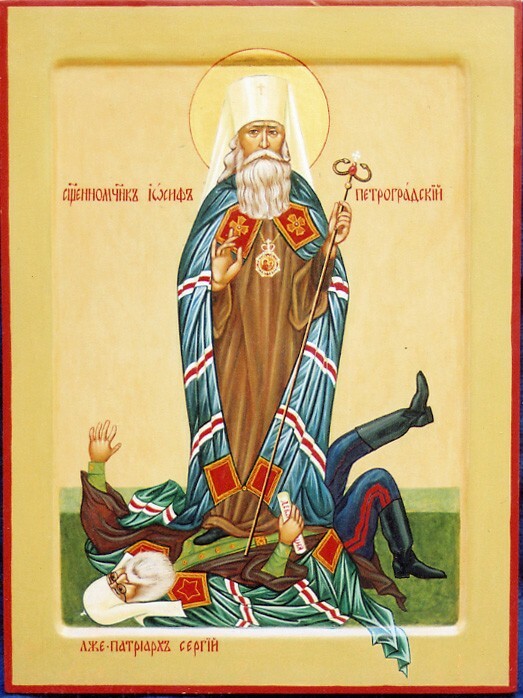 St. Joseph of Petrograd stepping on Patriarch Sergius... I think ROCOR was kinda angry. IIRC that one was covered in the Schlock Icons thread. Yeah, intolerance boarding on hatred. And we decry the "religion of peace"? Christ made the blind see, can we do something with that notion? 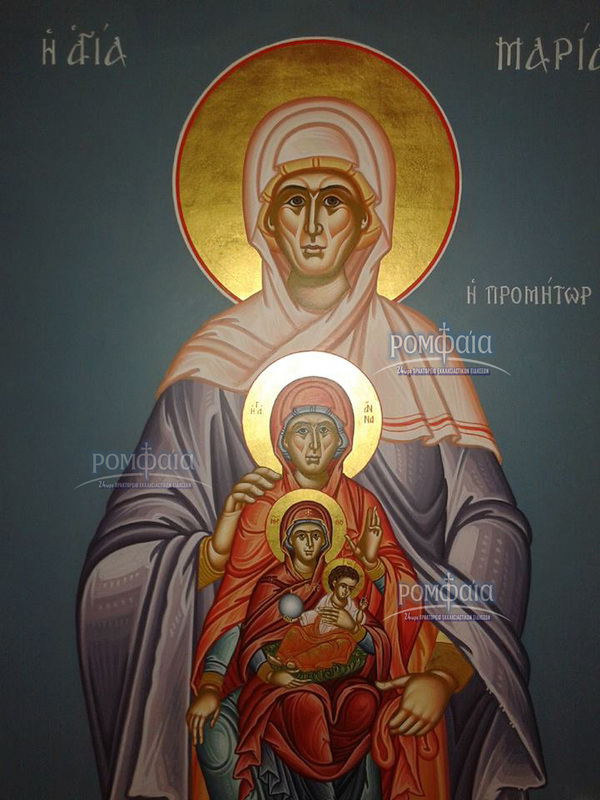 Looks like the Theotokos in the middle, but who are the others? Very interesting. It reminds me of the neo-classical vases I've seen from late 19th century England and France. Composed on the Holy Mountain of Athos by Athanasios, hieromonk of Simonopetra, Hymnographer of the Holy Great Church of Christ, at the pious request of the Most Reverend Bishop of Western America Maxim 2013. 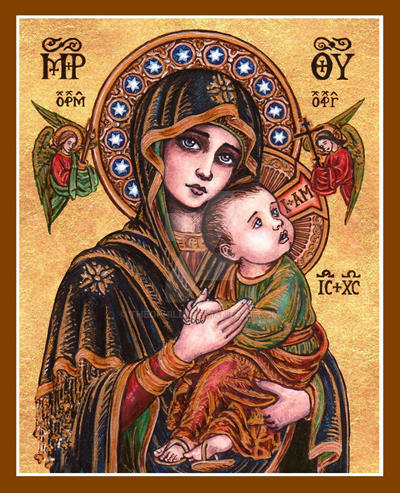 Have you ever seen Theophilia's icons? It's an RC Deviantart with very beautiful designs, I think a user of this forum has one of its icons as a prophile pic. Something in them estranges me though, I would hardly print and venerate any of those. I've seen them before and I don't like them. I think that the artist spends to much time trying to make the figures handsome/pretty/cute. They look more like paper dolls than icons. I agree. Probably why I find aesthetic but wouldn't venerate. Looks like they arguing for the gay & cutie crowd, or some of that prison tattoo work. You're right to see them as not suitable for veneration.